Like most Americans, we haven’t had much exposure to sake in the past, so we were thrilled to have the opportunity to taste through a dozen or so sakes available in the local market so we could learn a bit more about it. Pretty much the only thing we enjoy more than learning about drinking is drinking while learning, and by the end, we were totally on board. So once we had done the tasting, we decided on two bottles for the list, both of which are now available. 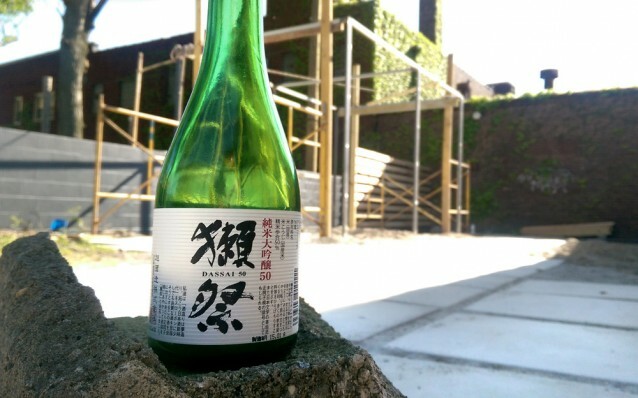 Clean but surprisingly oily and savory, this remarkable value sake struck us immediately as perfect for drinking with food. In general, sake is widely considered a food-friendly beverage, which is something we look for across our beverage program. But the texture and weight of Drunken Whale in particular makes it ideal for pairing with richer dishes like the fried perch or the grilled trout with fennel, but the clean finish and lack of bitterness lets it accompany plenty of other items from our current menu. Suigei, the brewery, labels this a Junmai, which typically carries a minimum seimaibuai (portion of the grain of rice remaining after polishing) of 70%. But they also label it tokubetsu, a term that denotes a remarkable quality beyond the legal designation. In this case, Drunken Whale is made from a single rice variety (Akitsuho) and also polished well beyond the requirements of junmai with only 55% of the original grain of rice remaining, discarding most of the fats and proteins that make up the outer shell of the rice. The result is a viscous, savory, flavorful drink that is simultaneously lean and dry. We prefer to serve it cold, but it would be worth experimenting with at different temperatures. The term “Otter Fest” is a reference to the name of the brewery itself: Dassai. Dassai means “otter festival,” a reference to an ancient name for the prefecture in which this sake is brewed, which was formerly home to a species of otter that would roam about the river beds and display the fish they caught, almost as at a market, bazaar, or festival, hence otter festival. Later, a regional poet took the name Dassai as he would spread his inspiration and reading material about his room much like an otter would its fish. Dassai proclaims it took the name from not just the otters but from the poet because it wanted to pay homage to both the regional history and artistic nuance. And from tasting the sake, it’s hard to disagree. We’re proud to serve the Otter Fest 50, made entirely from Yamada Nishiki rice, widely prized by sake brewers for its prime brewing characteristics (e.g., water absorption). Before entering the brewing process, the rice is polished down to 50% of the rice remaining. This extra polishing is, of course, a more labor intensive process and involves wasting a great deal of potential product in order to achieve a higher quality result. Dassai also makes a “39” and “23,” numbers again referring to the percentage of rice remaining after polishing. These sakes with such a high degree of polish, both literally and figuratively, are termed Daiginjo – a premium sake with more elegance and nuance. With no protein and fat left after polishing, only the starchy center remains. In this case, the result is honeydew, ginger, and peach on the nose and a less viscous, cleaner, more elegant mouthfeel when compared to the Drunken Whale. And it makes us crave some raw fish, a clean salad like our veggie carpaccio, or even some beef tartare. We’re only starting to explore sake, so it’s hard to claim any expertise. We’ve learned a bit, and more than anything, we’ve learned that we love to drink sake. And we’re thrilled to share these two with our guests. Cheers! Last week, we started switching up our red wine offerings in preparation for the nicer weather and lighter fare of spring. There will be more changes coming this month, and there are some interesting new reds already on the bottle list – but for now, the spotlight turns to two aromatically stunning reds that we recently started pouring by the glass. Chinon is arguably one of the better known regions of France’s Loire River valley, famous for its red wines made from cabernet franc. Many of the highly regarded, long-lasting wines from the region are produced from grapes on steep, stony slopes that lend themselves toward more structured, robust wines full of dark fruit, tannic structure, and even meaty complexity. This is not one of those wines. Instead, Messanges pours a bright and translucent shade of red, shows elegant floral notes on the nose, and demonstrates lighter red fruits on the palate. With herbal and spice notes, it’s certainly cab franc. But grown in sandy soils and aged without any oak, it’s one quaffable glass of grape juice. As with each of the wines we choose for our list, it’s selected for its versatility, able to accompany any number of our shared plates. Try it with the duck sausage. Or the rabbit ragu. Or the gnocchi. Or… you get the idea. Have fun with it. Elisabetta Foradori is well known for her eponymous wine produced in northern Italy under rigid adherence to biodynamic farming practices – but she and two friends also own and operate Ampeleia, an outfit based out of Tuscany. Home to Chianti, Tuscany is practically synonymous with the grape sangiovese, but Ampeleia, located in the coastal sub-region of Maremma, is focused on a more diverse Mediterranean mix of grapes. 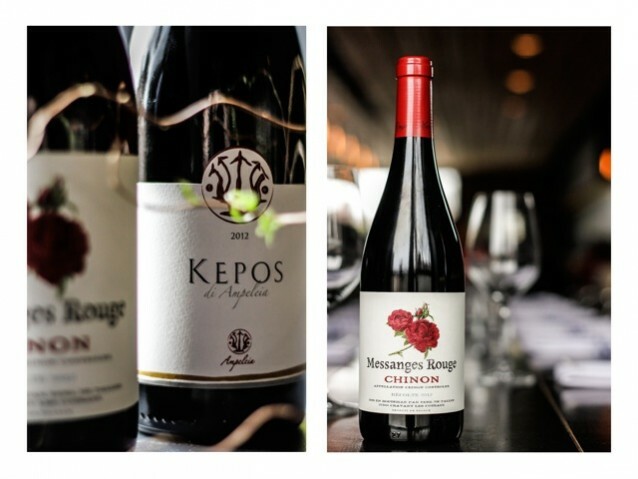 Kepos, their mid-level offering, is a blend of Grenache, Mouvedre, Carignan, Marselan, and the red-fleshed Alicante Bouschet. The resulting wine, grown along the sea in some of the sandier soils of Tuscany, possesses a beautiful nose of flowers and berries and shows a complex mix of fruits – dark cherry, black raspberry, and every other damn fruit we could possibly relay in our moderately pompous wine tasting notes – on the palate. Finishing bright and lively, this is just fun wine that, despite its medium/full body, drinks great on the patio. Photos in this post are courtesy of our delightful host Sarah Berger.